A real must-have is represented by espadrilles, the footwear with braided rope soles that reports immediately to mind the holidays and the desire of sea, sun and fun. Not only women but also men seem to appreciate the comfort and convenience of espadrilles, enough to even wear them into town, though they should be used only in a place for holidays. On the basis of the interest shown towards these summer footwear, ahead of the summer season many designers have decided to meet the needs of everyone and show off models suitable for all times, not only, therefore, that set aside for holidays, free time and especially for young people. For the summer season 2017, Loewe has decided to realise his very personal espadrilles, in the form of suede moccasins with contrast stitching that are well-suited to life in the city. Those signed Moreschi, suede and with rubber soles, are even designed to be worn in the workplace, while Brunello Cucinelli has achieved a unique shoe of its kind, designed for lovers of sneakers but at the same time the luxury. It is an interesting proposal made in denim, cotton and linen, leather and the bottom wrapped in rope, remember the classic espadrilles model. Inevitable Prada with its canvas jeans slip-on with elastic on the heel and in micro rubber sole with a two-tone bands. The rock variant is finally given by A. Testoni whose footwear reminiscent of a tattoo extravagant effect, while the canvas and jute sole with rubber shoes proposed by Pepe Jeans London will be very envied, ideal for boating. 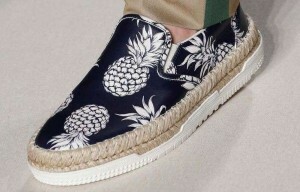 For the summer 2017, therefore, promises to be a jubilation of espadrilles for men who want to dress comfortable starting from the feet, without sacrificing elegance.